Okay, so Halloween is days away. Your costume is picked out, you’ve got a carved pumpkin and you’re ready for Trick-or-Treaters. Or are you? While dressing up as Eddie Munster is great for your chops, and getting ready to be winter-bearded, it is also a great way for you to connect with your community. In the past, Beardilizer has talked about how important it is to stay connected with your local (or international) beard community. Even if you aren’t going to competitions, it’s a great way for you to help make a difference in your community. Here are a few behind the scene operations that Beardilizer loves to hear about, especially since we truly appreciate the hard work that our friends and clients do. While attending competitions has certain privileges, the biggest winners are the charities that receive donations from the sponsors and attendees. Do you remember Whiskermania? Six thousand dollars were raised to benefit a veterans association. Beards for a good cause! Again, while competition is great, truly connecting with people is part of the steeze. With the rising popularity of beard competitions and clubs comes the ability to have a dialogue with non-beardy folk about all of the good work done by beardos. The Beardilizer staff, having grown weary of being compared to marauding monsters, thought it would be a great time to talk about the charitable side of their beards. In a few days, many people around the world will partake in ‘No-Shave November’. This concept was born out of a brilliant beardy mind, in an effort to increase awareness for cancer research. 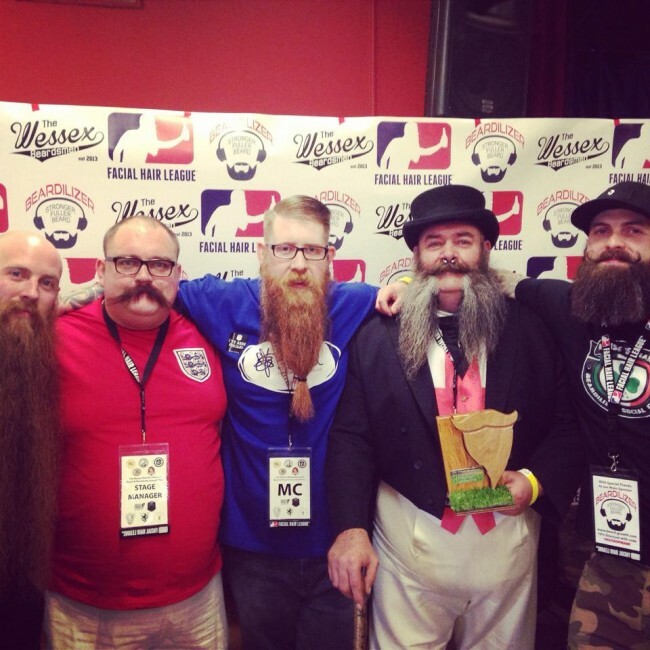 If you feel so inclined, research ‘beard competition charity’, and be prepared to be wowed by the overwhelming amount of information available to would be club members about beard and moustache clubs, their charity work, and how to get connected. The beard community is tight-knit, for sure. Team Beardilizer member, Jeff Langum inspired all of us with his with his monstrous mane, but most importantly with his ‘Go Team’ attitude regarding what many considered a huge upset at the recent World Beard and Moustache Competition. He posted a message to his social media reminding all of his followers that these competitions are all about connecting with old friends, making new ones, having a lot of fun, and taking part in a huge charitable event. While Jeff may not have been intentionally trying to debunk a boorish beardo myth, he certainly did. It’s about growing your community, not just your beard. This was an incredibly somber post about the importance of getting to know your fellow beardo and connecting with one another. While Halloween is about giving out candy, give a Majestic Beard Box to a friend in need and extend an invite to the next meeting of your local beard and moustache club. Remember, it’s not about competition between friends; it’s about growing your community and fostering a sense of comradery. After all, if you can take credit for introducing a potential champion to the world, that is quite the accomplishment. When your team does well, you do well. When you do well, Beardilizer does well.